The Merkaba mATX cube is a variant of the MM-Tektronix mATX test station. The Merkaba bottom panel incorporates an Illuminated Anti-Vandal switch for an external power button source as well as LED indicator. The lid of the Merkaba has perforated holes in a triangular pattern along the left and right sides to allow air to flow in and out of the chassis. The backside of the lid includes a cutout for the mATX I/O panel. While the MM-Tektronix mATX test station is designed to operate with lid removed, these modifications to the lid of the Merkaba allow functionality with the lid installed. The Merkaba mATX cube makes use of tapered screws and countersunk holes throughout the case. This gives the case a very clean and seamless look and feel. Bottom Piece: holds full ATX power supply, full-size DVDR/CDR drive and room for either two (2) 2.5 SSD or hard drive or one (1) 3.5 hard drive while the top of the base unit contains standoffs to hold a mATX/mITX motherboard with easy access cutouts along 3 of the 4 edges for all power and data cables. The motherboard tray portion can rotate 180 degrees so the I/O panel faces towards the front or rear (PSU side) of the case. 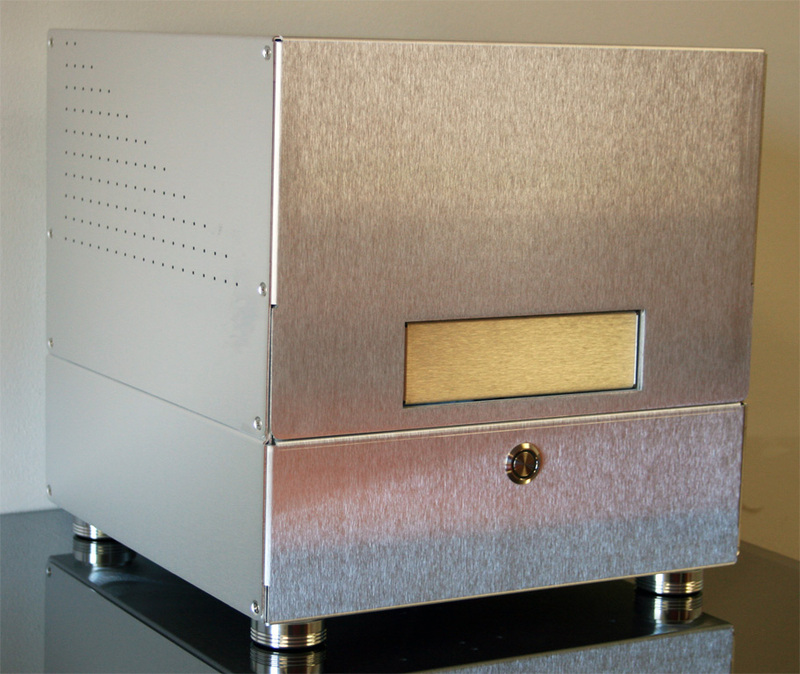 The CDR/DVD cage can also be installed towards the front or back of the case. 2 sets of counter sunk mounting holes are implemented into the tray for installation of the CDR/DVD allowing for greater flexibility of use. Top Piece: provides a cover which is attached to the base unit by four (4) screws, 2 on each side and (6) screws that attach the lid to the I/O panel. To access the inside of the case, remove 4 screws on the sides of the lid and the 6 screws that attach the I/O panel to the lid. After removal of the screws, simply slide the lid off. The case is constructed of 1.65 mm thick aluminum covered by a powder-coated, black wrinkle finish that is scratch and abrasion resistant. The MM-Tektronix mATX test station comes fully assembled and includes a set of 10 motherboard standoffs and mounting screws to secure a motherboard into the unit. 4 x 6-32 computer screws come installed into the I/O panel for installation of PCI(E) devices. 3 PCI cover plates are included installed. A high quality Illuminated Antivandal switch with a 600mm switch connection kit are included installed. Four (4) high quality Mountain Mods Billet machined Aluminum case feet w/ rubber pads isolate the case and prevent marring or scuff marks on the surface it resides on. Empty Weight - 7 lbs.